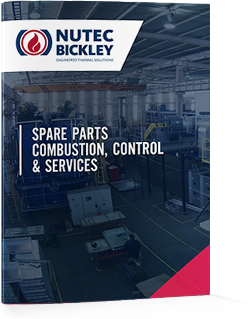 We have the highest quality spare parts in the areas of combustion and control. These are available for all types of application and existing equipment, whether that equipment has been manufactured by us or by other companies. Combustion equipment requires regular maintenance, and our team of service engineers can assist you in anticipating which spare parts you will need in the future in order to keep your kiln or furnace in good working order and operating to its maximum capacity. Regularly scheduled maintenance servicing will help you increase productivity and to maintain the required output levels. Our services range from supplying direct replacement parts through to individual selection of custom-made parts for specific processes. We have a dedicated team to advise our clients on any spare parts they may need and to offer solutions tailor made to their particular requirements. All our equipment and spare parts are easily identified via a unique order number that helps us immediately track them from stock. Call us and we’ll respond to your request. We are committed to providing fit-for-purpose products and offering a top-level service right across the process – our mission is to meet and overcome all technical challenges and to establish long-lasting business relationships. Based on an historical analysis of your inventory we will offer advice to help you identify which spare parts you need to have to hand and to assist with optimizing your stock, avoiding the retention of dead stock. We hold a stock of critical spare parts that can immediately be dispatched in emergency cases, so that our clients can continue in operation without production stoppages. We are able to identify and replace obsolete components, making adaptations to combustion systems in line with up-to-date safety regulations and we aim to help you move your systems over to more current technologies. We hold a large stock of the most critical spare parts, available for immediate delivery. We keep customers advised of their order status, providing real-time information. We bring extensive knowledge of the engineering and installation of every spare part that we supply, enabling us to recommend the best option for each application. We will opt for substitute parts – either because of obsolescence or price – in accordance with your budget. We work with Fives North America and other market-leading brand names. Fives North American Combustion has been a leading supplier of equipment and control systems for almost a century. Its excellence in engineering and its wide experience have led to high quality products and world-class technology, thanks to which it has become a renowned name in the combustion field. We are suppliers of parts and spare parts of recognized brands such as Elster, Eclipse and Kromschroder, belonging to the Honeywell family of products. These brands include combustion solutions and gas controls for heating and process applications: from filters, regulators, shut-off valves and safety controls, to sophisticated burner management systems. Manufacturer of cutting-edge products and system solutions designed to safeguard, measure and control gases. It offers a wide range of services, backed up by excellent sales and customer support teams. This company supplies combustion products and gas controls for both process and heating applications: from filters, regulators, shut-off valves and safety controls, through to sophisticated burner management systems.